Aid is an important tool for promoting economic development and welfare, and forms an important part of many governments’ foreign strategy. 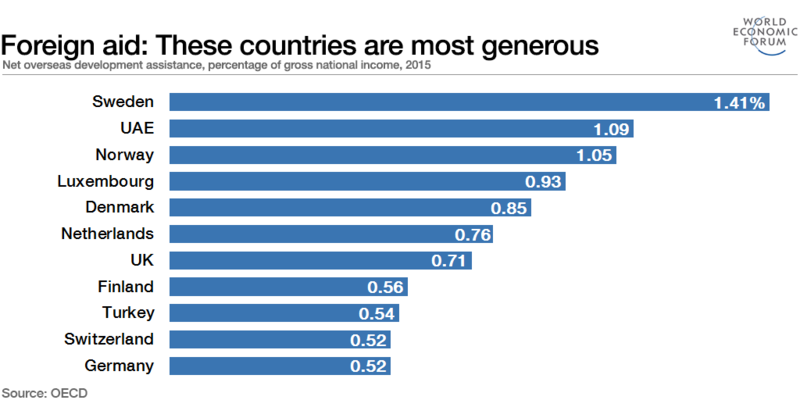 But which countries are most generous? Well, it depends on how you look at it. Looking at official development assistance (ODA), the OECD has calculated its members ’ spending in 2015 – both in total and as a percentage of gross national income. The US, unsurprisingly, comes top when looking at total spend. Last year, it gave over $30 billion either as bilateral aid or through international organizations such as the World Bank or UN. 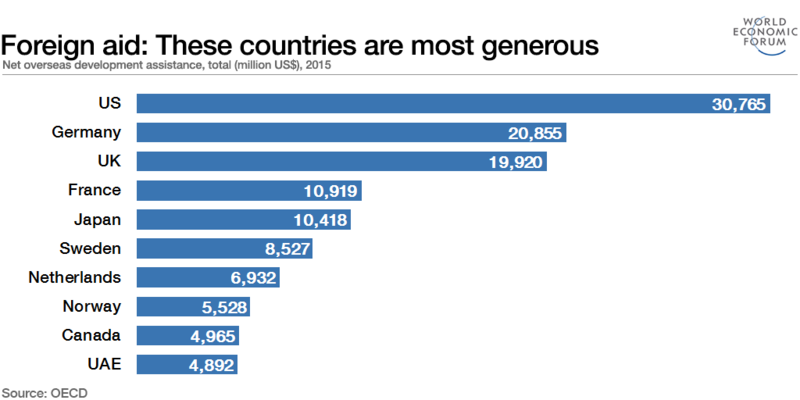 Germany is second, with over $20 billion of ODA last year. This constitutes an increase of over $4 billion compared to 2014 . The list is dominated by European nations, but the UAE, Canada and Japan also feature. A very different picture emerges, though, if we consider it as a percentage of gross national income. Much like the US for total spend, Sweden emerges ahead of the crowd on this measure. Last year, Sweden’s net ODA was 1.41% of gross national income, and the country has committed to keeping this figure above 1%. The UAE is second, with Norway just behind – both returning figures of over 1%. The UN calls for economically advanced countries to spend at least 0.7% of gross national income on ODA. The OECD argues this is perhaps the “best known target in international aid”. However, as the chart above shows, few countries have met it. As humanitarian crises continue around the world, aid remains as important as ever. But with few countries meeting the UN’s target, there’s plenty of work left to do to hit the 0.7% level.